In my son's first nursery, I thought I would surely win "negligent mother of the year" by using this glider rocker and ottoman salvaged from the dumpster. I painted it white, washed and sun-dried the cushions, then slipcovered them in an old chenille bedspread. (Remember, I'm not crafty...so one of the classroom parents sewed the cushion covers as a gift!) I still remember the cozy texture of that well-worn chenille as I rocked in the wee hours of the morning. The little table to the left is a salvaged file cabinet covered with a Pottery Barn Kids duvet cover from the thrift store and an extra glass top. Later we used the duvet cover for his big boy bed. Who would have thought I'd be unfolding a Pack 'N Play for the new baby and calling it a day! Most of my house is furnished with cast aways. I think of it as "adopting" items that still have many years of use. 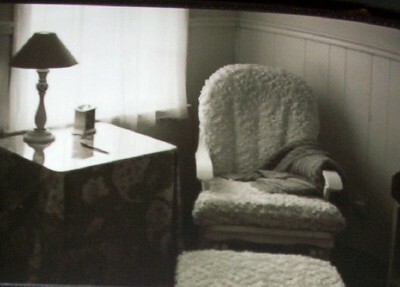 I am sure teh chenille made that glider rocker very cozy.